So you’ve done the right thing and got a PPSR vehicle search report. Now you need to be able to understand what it says so you can get the most out of it. There’s no point getting the report if you can’t make heads or tails of it. Luckily a PPSR report is pretty easy to read, once you know what you’re looking at. When you receive a PPSR Check from QuickRevs you’ll first see a quick summary. This gives you a broad look at what you’ll find in the report. The summary itself is divided in half. On the one side you’ll see a rundown of all the different records that were found as part of the search. These are categorised as “Finance Check”, “Written Off”, and “Stolen Status”. These sections will either say there are no records to report, or list the number of records to report. How to read ppsr report sample ? Cheap & free PPSR car history report for wa, nsw, qld, nz, vic record are available here. 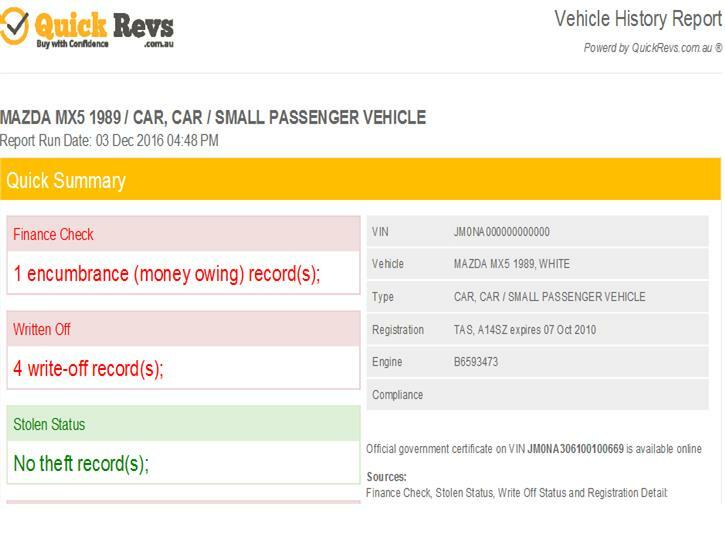 On the other side of the summary you’ll see vital information about the car itself, such as the VIN, vehicle make and model, any applicable registration number, and the engine number. These numbers can be checked against the car itself to determine if the parts are genuine, or if the vehicle has been tampered with in any way. After reading your PPSR report you might find that there are outstanding financial encumbrances attached to the vehicle. Your next step would be to check the information provided under the “Secured Party Details”. The secured party will help you identify who or what owes money on the vehicle as a debt. It’s possible for a vehicle to have more than one encumbrance on it at a time. Using the details under Secured Party Details allows you to sort through the different encumbrances and find out if, and how, they’re being repaid. This allows you to assess whether you think the car is at risk of being repossessed out from under you any time in the near future. NEVDIS is an important component of the PPSR report. The organisation contributes to validating where the VIN attached to your car is valid or not. It also cross-checks and verifies the serial number and chassis number. The NEVDIS maintains databases on all vehicles in Australia. The details for these databases are supplied through various road safety agencies and should be accurate and up to date. This is also where specifics for the write-off status of the vehicle — if any — are located. You’ll be able to see if the vehicle is a complete write-off or a repairable write-off, as well as what the specific damage is. It’s important to note that the report is written in a technical language and might be difficult to comprehend. If you’re unsure about any of the details, consult the Secured Party Details for further information regarding Financial Checks, or with your state roadside assistant service for details on damages. Don’t waste time or money buying a dodgy car. Get a PPSR Check today.